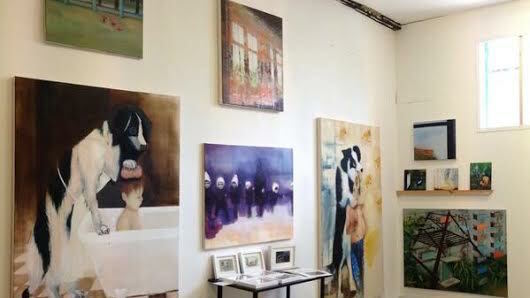 A few of Dina's works in her studio. 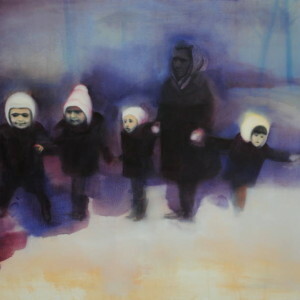 Dina Varpahovsky was born in Saint Petersburg, Russia, and currently lives and works in London. She received her BFA from Central Saint Martins College of Art and Design, London, in 2012. 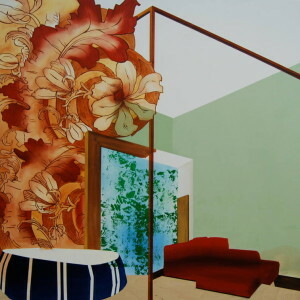 Dina often paints interior spaces, where she carefully balances form and color with sharp, concise lines and shapes. 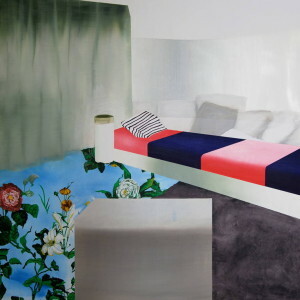 At its core, her work is about constructing psychological spaces that are inspired by the phenomenon of ‘screen memories.’ Dina has exhibited in a number of group shows, including Chateau d’If at Shoreditch Town Hall, Summer Show at Islington Arts Factory, and the Affordable Art Fair Battersea. 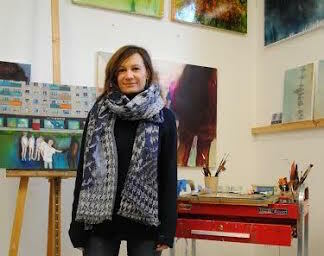 She has had solo exhibitions at Chelsea & Westminster Hospital, Canary Wharf Window Gallery and the Zetter Hotel. 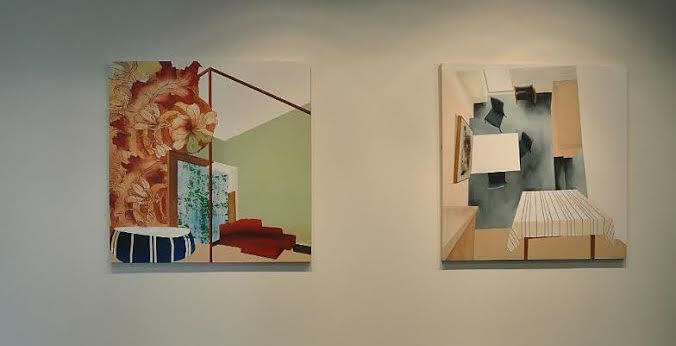 As part of XAP collective of emerging artists, Dina initiated and participated in The Psychotropic House, which was a group exhibition and symposium held at Yinka Shonibare’s Guest Project space in January 2014. 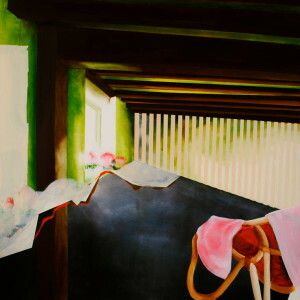 Broadly speaking, the major themes in my work relate to childhood, memory, trauma, and nostalgia. Not to focus solely on my own memories and experiences in my practice but to keep my work open to what is happening in the world around me. Filter current events through your own history, and you will never run out of things to paint. This advice was given to me by Graham Crowley, a painter and a teacher. I work in silence. If I had to put the music on, it would be Achtung Baby by U2. I was introduced to this album by some American students in the early 1990s back in Russia. At that time, Russia was going through landslide changes; it was dark, cold, and hungry. Listening to the songs on that album made me feel that there was a whole different world out there and, if I really wanted, I could become a part of it. It would be Destruction of the Father by Louise Bourgeois. 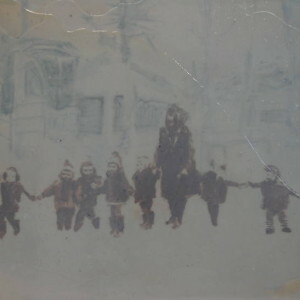 I am attracted to the darker aspects of familial relationships, and I find this work both terrifying and reassuring. My favourite writers are Vladimir Nabokov and JG Ballard.